From Series: "WHAT HAPPENED? 2018 Women's Retreat"
What Happened? Living the Life God Gives You! 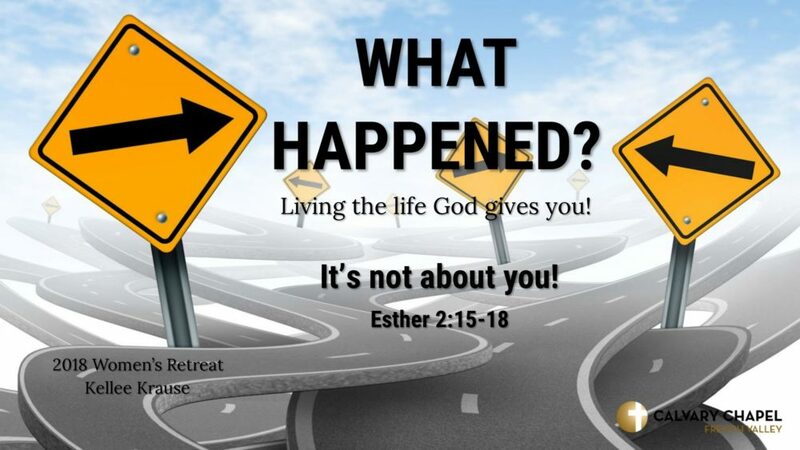 Key Scripture - Esther 4:14b: “Yet who knows whether you have come to the kingdom for such a time as this?” Overall Theme: Realigning our life to match what God intends for us. For our retreat this year, we will be looking at the story of Esther but concentrating primarily on Ch. 2-4. There are some great passages in this book we can learn from and apply to our own lives. Esther was a simple, young Jewish girl who had been exiled with her people to a distant land where the people were very different from where she had come from. She was an orphan whose parents had died and so she had been raised by her cousin. Little did she know how drastic the changes in her life would be! What happens when your plan is not God’s plan for your life? When life throws you a curve ball, what do you do? In these four messages, we will try to communicate to the women, that God is sovereign over everything and has a purpose and plan for it all, even when things go differently than expected. He has created each woman for a purpose. No matter where they’ve been or who their parents were, what they’ve done, or what’s happening in their lives, it all has a purpose. God created them for a reason and He wants them to find out what that is. It is the goal of our retreat is to teach the women that their life is unique and special and is as important as the colors of thread that create a beautiful tapestry. Each of us are important and have a purpose in the overall design of God’s creation. Our challenge is to find out what it is and cooperate with God in it. And who knows? Why are we here, right now and at this time? Could it be for such a time as this! More From "WHAT HAPPENED? 2018 Women's Retreat"